The “Eislicht” is starting a new evolution in case illumination. Current LEDs have a very piecemeal illumination that’s anything but consistent. Older cathode tubes offered a much more pleasant light, but had a short lifespan and weren’t very easy to place due to their large size. The Alphacool Eislicht combines the long lifespan of LEDs with the uniform, consistent glow of a cathode tube. In order to combine these advantages, Alphacool used a proven technology used in monitors and TVs for backlighting. This makes Alphacool the first manufacturer in the world to bring this technology to the market for computer illumination. So that the Eislicht can be mounted in any position, Alphacool ships it with four screws with magnetic heads. 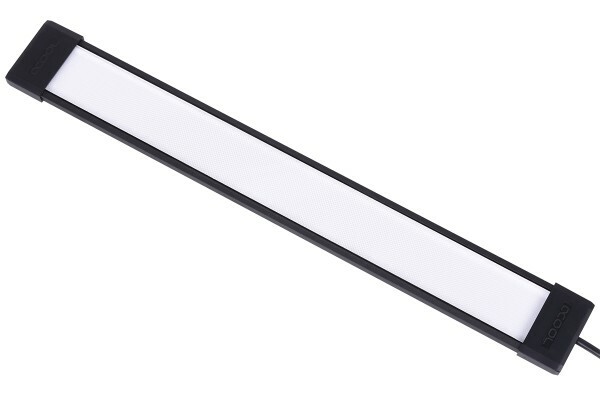 This makes the Eislicht easy to install, as well as easy to remove and reposition. Since aluminium cases and plastic components aren’t magnetic, a double-sided adhesive strip is also included. The lights are powered through an RGB male plug. An Aurora LED RGB Controller (Art. no. 1013887) is required for power supply and the RGB effect. This item is not included in the delivery and must be ordered separately. Sind die RGB-LED Produkte kompatibel mit " RGB-Fusion, Aura, Rainbow Lighting, Etc.. und wird es eine " programmierbare " drei-polige digitale Variante geben? RGB Fusion und die ganzen anderen Namen die Boardhersteller für ihre RGB Controller nutzen stellen nichts weiter dar als völlig normale RGB Steuerungen die lediglich eine Software verwenden um die Einstellungen direkt am PC zu verändern ohne das man auf einen Physischen Conroller zurückgreifen muss. Ansonsten verwenden sie alle ganz normale RGB Controller an die man alle üblichen RGB LEDs ect. anschließen kann. Kann mit der LED Leiste auch UV Licht abgestrahlt werden? Nein, das können sie mit aktuell keinem RGB Licht auf dem Markt. Sie müssen sich hier immer zwischen einem UV- und einer RGB Version entscheiden.